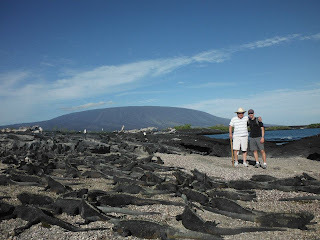 Ezra, the iguanas and me in the Galapagos. Those of you who know my grandson Ezra know that he is a budding scientist with an intense interest in biology, nature and animals. 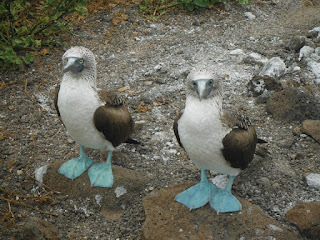 That is why we offered to take him on a trip to the Galapagos Islands in celebration of his bar mitzvah (an offer that he readily accepted!). What with school, summer camp, skiing and who knows what else, however, today’s teenagers lead such active lives that the earliest that Ezra could fit the trip into his busy schedule was this year – fully two years after his bar mitzvah. As it turned out, that was probably all to the good because he probably got more out of the trip at 15 than he would have at 13. And it gave Sue and me an extra two years to anticipate what turned out to be a wonderful experience. 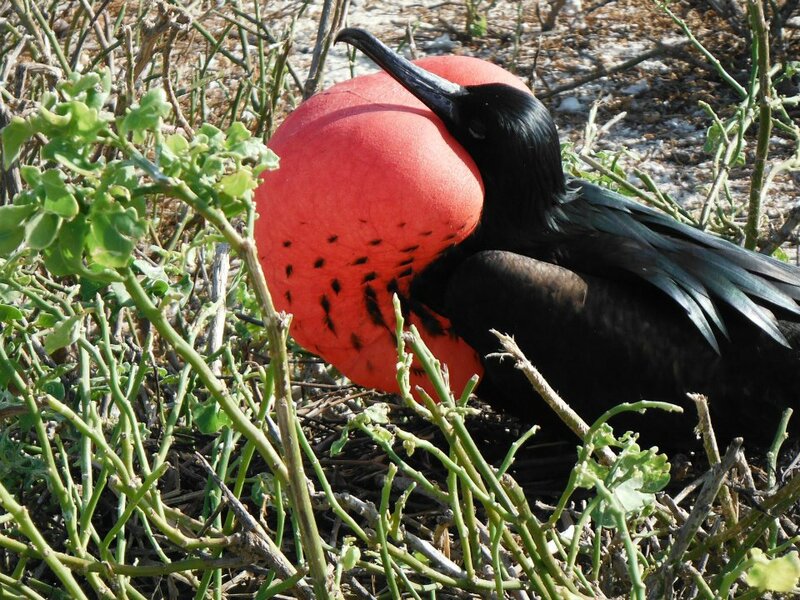 Great Frigate Bird on Genovesa. Photo by Ezra Hornik. 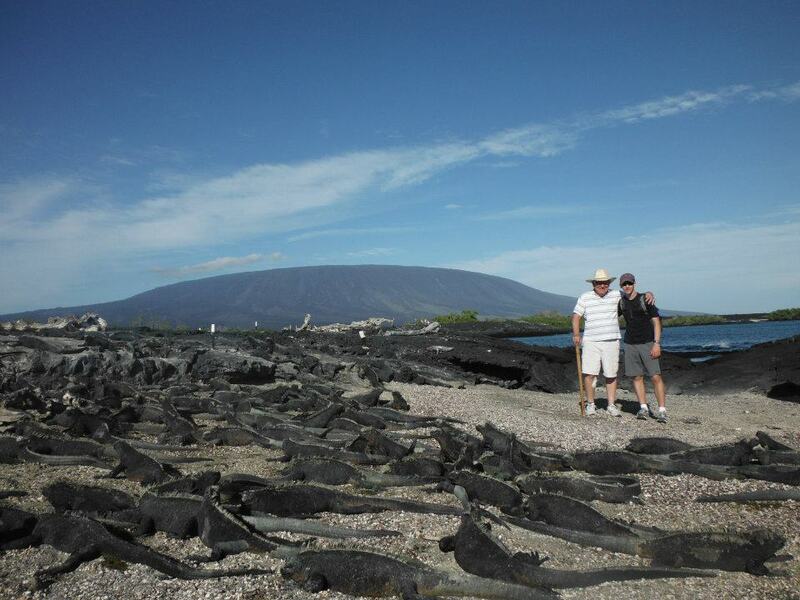 We planned the trip ourselves, doing most of our research on the internet and relying substantially on comments posted on Trip Adviser by travelers who had preceded us to the Galapagos. That worked out very well. 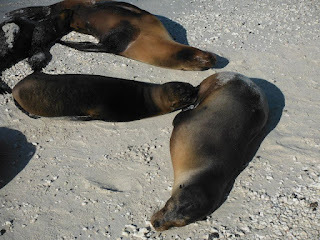 Our first decision, to opt for a cruise rather a few days of island hopping from a single land based location, was correct: there is more than enough diversity on the several islands and they’re spread far enough apart to justify going the cruise route. And our second decision, to spend a week at sea rather than just a few days or two weeks, worked out as well: seven nights at sea, rather than just four (or 14) turned out to be just enough for us (and not too much). 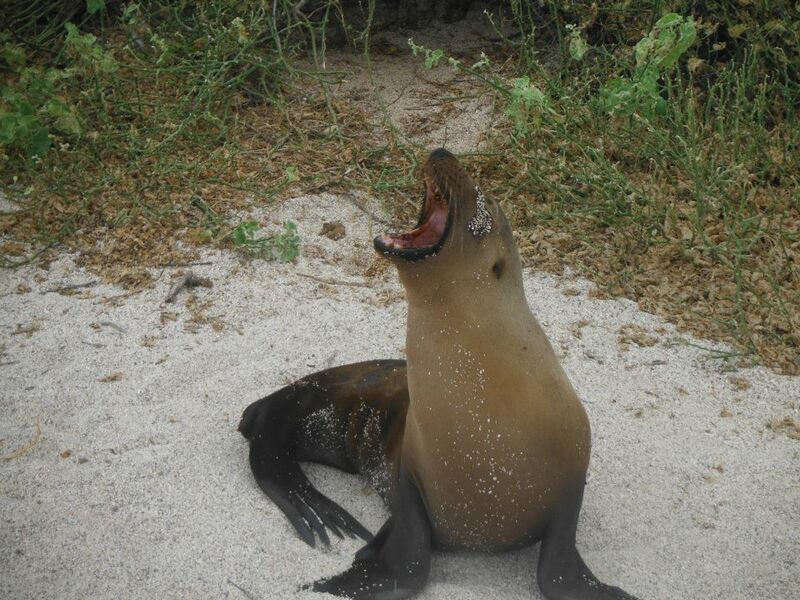 Sea Lion in the Galapagos. Photo by Ezra Hornik. There were lots of ships of different sizes for us to choose from but the reviews we read of the three yachts in the Ecovenutra line – the Eric, Flamingo and Letty - were uniformly positive, so that’s the line we chose. We didn’t get to pick the specific ship – Ecoventura assigns you to one of their three vessels when you arrive – but the three ships are virtually identical in configuration and we had no way of distinguishing in advance among the crews of the three. As it turned out, we were assigned to the Eric and we were more than satisfied. Pelican in the Galapagos. Photo by Ezra Hornik. We still had to make a couple of other decisions: our ship was scheduled to sail from San Cristobal, Ecuador on Sunday, June 10 but there are no flights from NY to San Cristobal; we would have to book an international flight to Quito, Ecuador or Guayaquil, Ecuador and then take a shuttle flight from there to San Cristobal. Moreover, not only are there few flights from NY to Quito or Guayaquil but the connecting flights from Quito or Guayaquil to San Cristobal are notoriously unreliable and we didn’t want to risk missing our connections. So we had to decide when to fly out of NY, whether to stay in Quito or Guayaquil, and where to stay in Quito or Guayaquil once we got there before embarking on our cruise. 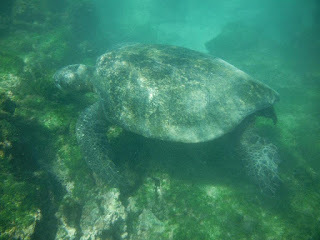 Sea Turtle underwater in the Galapagos. Photo by Ezra Hornik. We chose to give ourselves plenty of time and to stay in Guayaquil: we booked a flight on American Airlines from NY to Miami on Thursday, June 7 with a connecting flight from Miami to Guayaquil that day. And we booked a room at the Hampton Inn Downtown in Guayaquil. Our plan was to spend Friday and Saturday in Guayaquil and then fly from there to San Cristobal on AeroGal on Sunday. We chose to stay in Guayaquil rather than Quito because it is closer to San Cristobal; indeed, the AeroGal flight to San Cristobal takes off from Quito and stops in Guayaquil before going on to San Cristobal so it does save time (and a few dollars) to fly from Guayaquil rather than Quito. Crabs in the Galapagos. Photo by Ezra Hornik. That being said, however, Guayaquil really isn’t that entertaining a town and it might have been a little more fun to have spent the time in Quito instead, but I’ll really never know. There are a couple of small museums in Guayaquil, a large number of historic monuments, a long stretch of land to stroll along the waterfront boasting a rather non-descript mall and an equally non-descript market, a scattering of fast food and other forgettable restaurants, and an unusual park, Parque Bolivar, which is home to hundreds of iguanas roaming free. If you do go to Guayaquil, check out the park; we didn’t find anything else there noteworthy. Heron in the Galapagos. Photo by Ezra Hornik. The Hampton Inn Downtown is listed as a five star hotel and it certainly met our needs. It was clean and inexpensive; it boasted a gym, spa and sauna; our room rate included a very satisfactory buffet breakfast; staff was very accommodating (if somewhat inefficient); the food at the hotel’s restaurant was surprisingly good; and the location is superb – within walking distance of the waterfront and the Parque Bolivar and only about a 15 minutes ride to the airport. But a five star rating is a real stretch. 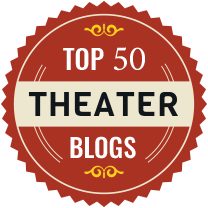 I’d probably give it three although it well may be as good as it gets in Guayaquil and, within that context, I would not hesitate to recommend it to you. 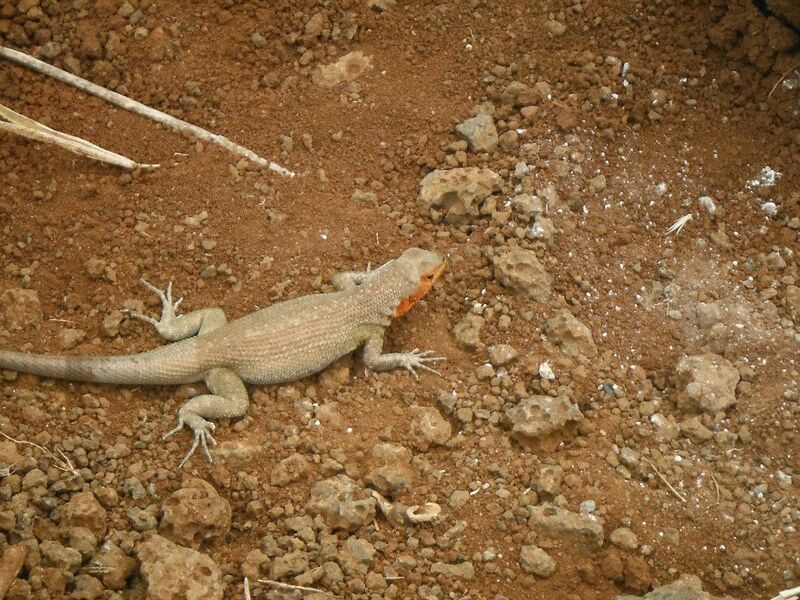 Iguana in the Galapagos. Photo by Ezra Hornik. On the morning of Sunday, June 10, we checked out of the hotel and took the hotel’s shuttle bus to the airport. There we were met by Ecoventura’s representative who checked our baggage through for us and accompanied us on the short AeroGal flight to San Cristobal. We were met in San Cristobal by another Ecoventura representative who arranged for our bags to be sent directly to our cabin on the Eric and who escorted us to the ship. 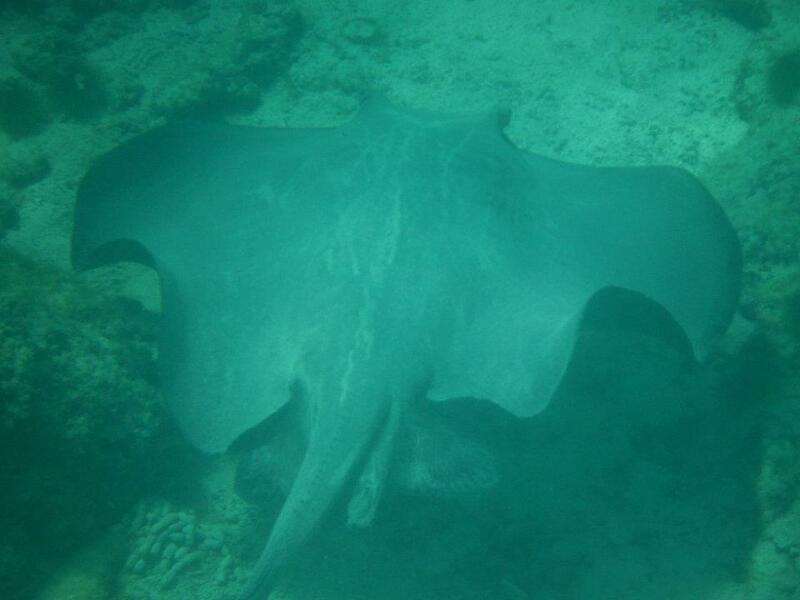 Manta Ray underwater in the Galapagos. Photo by Ezra Hornik. We boarded the Eric, were introduced to the captain, the crew and the other passengers and were shown to our cabin. The Eric accommodates just 20 passengers in nine cabins and a crew of about 12 (including the captain, two guides, a first and second mate, two cooks, a bartender/waiter, a steward, an engineer and a couple of panga drivers). (A panga is a small raft-like vessel that transports passengers to and from the yacht and the islands). Our cabin was a little small for the three of us but we spent virtually no time in it other than to sleep so it really didn’t present a problem. 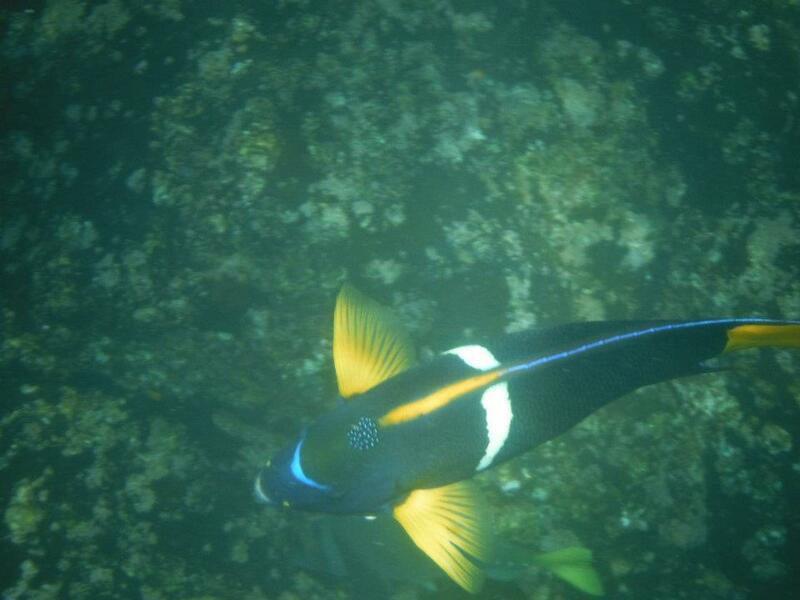 Unknown fish in the Galapagos. Photo by Ezra Hornik. 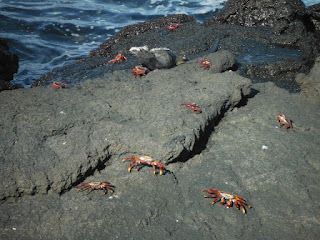 We were served a buffet lunch on the Eric and received a safety drill and then were promptly taken from the yacht by bus to La Calapaguera Cerro Colorado on San Cristobal Island where the National Park has established a breeding program for the land tortoises. 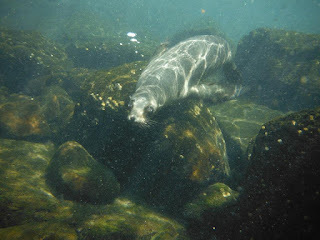 We saw these amazing creatures, many well over a century old, in their native habitat and learned about the threats to their continued existence and what the National Park is doing to save them. 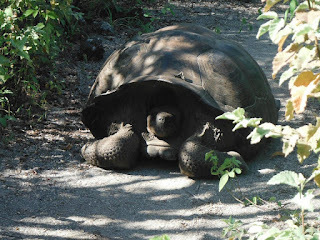 Giant Land Tortoise. Photo by Ezra Hornik. 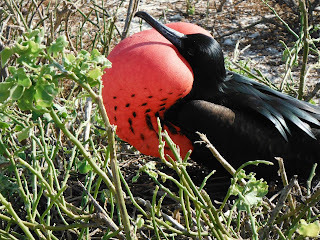 Over the next several days, we visited eight other islands - Genovesa (also known as Tower Island), Santa Cruz, North Seymour, Fernandina, Isabela, Santiago, Rabida, and Santa Fe – before returning to San Cristobal. 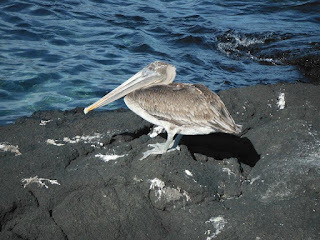 In the course of our travels, we crossed the Equator six times and saw an incredible number of bird species including red footed boobies, blue footed boobies (my favorite), nazca boobies, storm petrels, great frigates, magnificent frigates, swallow tailed gulls, greater flamingos, pelicans, penguins, blue herons, lava herons, flightless cormorants, mockingbirds, and far too many others to mention. Blue Footed Boobies. Photo by Ezra Hornik. 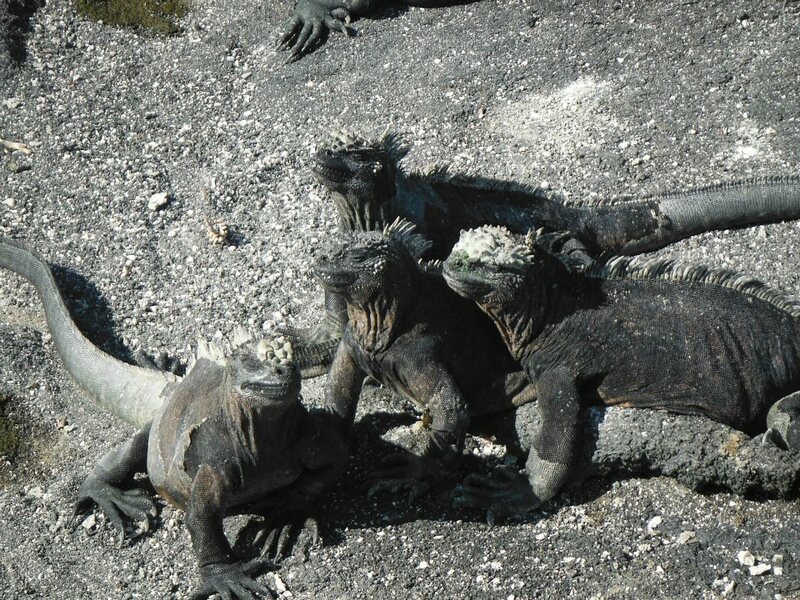 The birds were astonishing but so were the land iguanas, marine iguanas, sea lions, crabs, lizards, sea turtles, giant land tortoises and large number of fish. 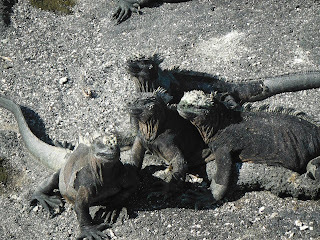 We were awakened every morning at about 6:45 AM, breakfasted on board the Eric, and then were transported by panga from the yacht to one of the islands (usually with a wet landing) where we were led by our guide on a walk of about a mile or more, sometimes on a beach, sometimes in the rocky remnants of a volcanic eruption. That walk generally was followed by an opportunity to snorkel (an opportunity which Sue and I reluctantly forewent but which Ezra availed himself of every time and which probably represented the high points of the trip for him). 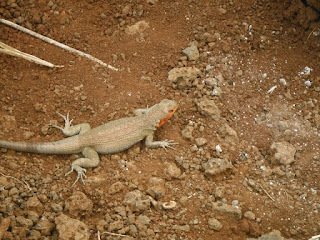 Another iguana in the Galapagos. Photo by Ezra Hornik. Following the walk and snorkel, we were returned to the Eric via panga for a buffet lunch. In the afternoon, we visited another part of the island or another island entirely and were given another opportunity to snorkel. Then it was back to the ship for a briefing on the next day’s activities, dinner and, by this time thoroughly exhausted, to bed. Baby Sea Lion playing with Ezra underwater. Photo by Ezra Hornik. So here’s the bottom line. The trip was phenomenal. Sue and I participated in most (albeit not all) of the guided hikes. Our guides were terrific, warm, knowledgeable and entertaining. I thought that the meals were good but not great, but I’m a tough food critic: most of the other passengers on board raved about the food. Accomodations were adequate. Public areas were ample and the captain and crew were first rate. We had a great time. More Sea Lions in the Galapagos. Photo by Ezra Hornik. And Ezra had the best time of all. 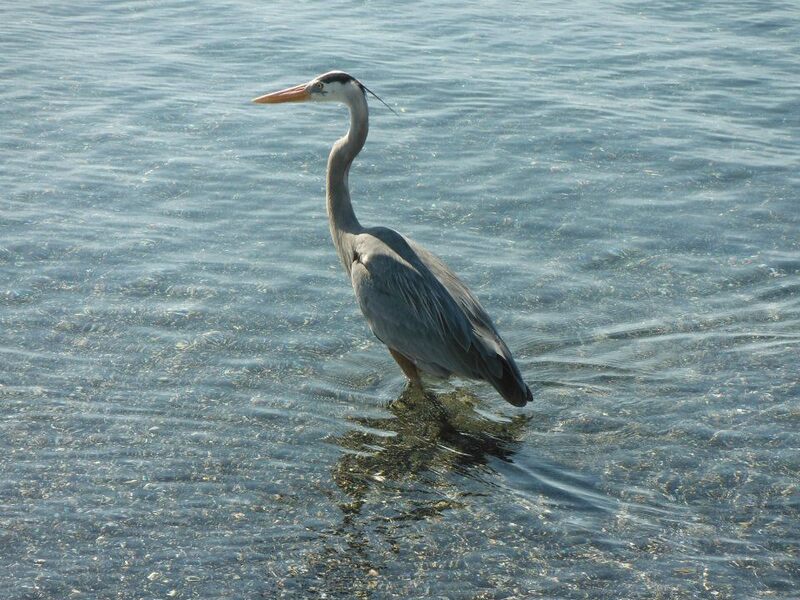 He was first on line for every meal, went on all the hikes and snorkeled at every opportunity, cavorting with baby sea lions underwater and photographing fish and turtles with his underwater camera. Ah, to be 15 years old again!